This villa is very spacious and airy with marble floors throughout. There is an entrance porch and hallway which leads to the lounge and bedrooms. The lounge has two sets of patio doors leading onto garden and BBQ area. Two of the bedrooms also have patio doors leading onto a terrace. The lounge, dining room and kitchen are large and open plan with a breakfast bar. Wireless internet has been installed to which ipads, tablets, mobile phones, laptops etc can all be connected. There is UK television with BBC, ITV, channel 4 and other channels.. The television is a flat screen model. The villa has full air conditioning/heating throughout all bedrooms and lounge and the lounge has an additional open fire. Both the bathrooms have electric heaters for winter bookings. There is also a utility room adjoining the kitchen which houses the washing machine. The private pool is kidney shaped and as the garden faces south there is all day sunshine. In the garden there is a pool table and a table tennis table. A car is recommended and the villa is only a 4 minute drive to El Coto which has 4 restaurants and bars, supermarket, chemist and pizza take away. The large hypermarket is a 6 minute drive with Fuengirola and its beaches just 7 minutes away. Mijas is approximately a 10 minute drive. The villa is accessed through an electric gate to which a security code and remote control is provided. This gate closes immediately after you enter and you drive down a driveway to the villa and there is parking next to the gate to the villa. This ensures the villa is both private and secure. The villa is on one level but there are three steps from the parking area to the villa. A ramp can be provided for these steps if required for a wheelchair. The fully fitted kitchen has cooker, hob, fridge/freezer, microwave, dishwasher, toaster. The kitchen is very spacious and has door to the outside BBQ area making it very easy for outside eating. It is also open plan with breakfast bar to dining room and lounge. Large air conditioned lounge with 2 beige leather sofas, coffee table, sideboard, TV, Stereo system, DVD player, open fireplace. The television is flat screen with UK television via satellite. The internet is wireless.There is a dining area with table and chairs for 6 people. 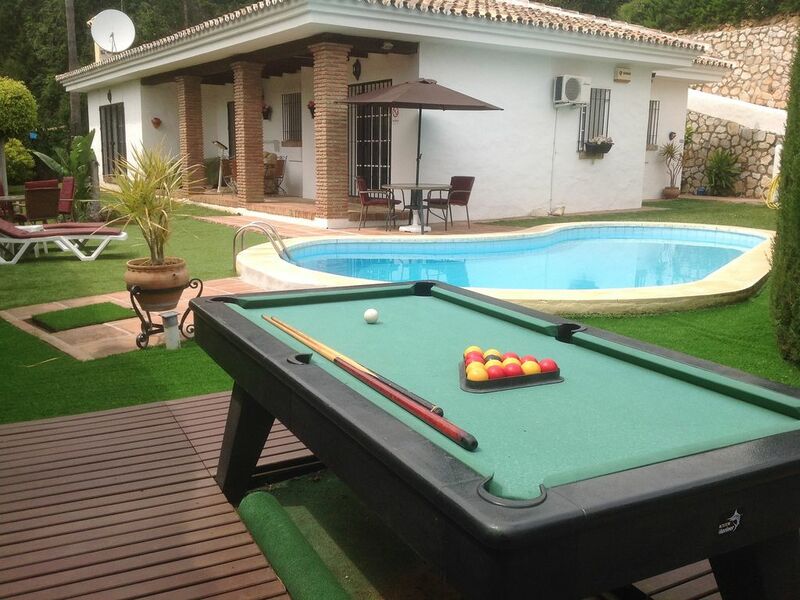 In the private garden there is a pool table and a table tennis table for guests which is always very popular with both the young and not so young! I am David Ainscough and I am the property manager for the villa on behalf of Linda and Pat. Unfortunately Linda’s elderly mother in Uk is very unwell and they have asked me to look after the property for them. Nothing in the villa has changed except I will be looking after the property and guests. Myself and my wife Karen have lived in Spain for a while now and my wife Karen’s parents have lived here for 17 years. I used to be a chartered accountant and am now having a complete change of direction in my life which hopefully will be far less stressful and much more enjoyable. I assure all guests that I will look after them personally to ensure they are comfortable in the same way as Linda and Pat have always done. We chose this area to make our new home because we have spent so much time year over the years when visiting Karen’s parents and we just love the area. We like it because there is so much nearby with lots of shops, restaurants, sandy beaches. Fuengirola is also very central to visit lots of interesting places on the Costa del Sol. When you stay at Villa Higueras we make sure that the villa is a place that you always feel at home in. We always keep an eye on things so that everything is just what our guests want, which is why we have installed the wireless internet as we felt it was an important thing to have for people on holiday to keep in touch with both family and business etc. The villa is very conveniently located as it is quiet and private but also a short drive to shops, beaches and restaurants. As we live so close we look after everything personally and should our guests have any problems we can be there within 15 mins to help in any way we can. The villa is always kept up to date with appliances and we have just put in a new fridge and a flat screen television with UK television via satellite. En-suite bathroom to bedroom 1 with bath/shower over, bidet, 2 basins in a marble vanity unit and toilet. 2nd bathroom with bath/shower over, bidet, basin and toilet. Large air conditioned lounge with 2 beige leather sofas, coffee table, sideboard, TV, Stereo system, DVD player, open fireplace. The television is flat screen with UK television. Wifi router. There is a dining area with table and chairs for 6 people. The fully fitted kitchen has cooker, hob, fridge/freezer, microwave, dishwasher, toaster. The kitchen is very spacious and has door to the BBQ area making it very easy for outside eating. It is also open plan with breakfast bar to dining room and lounge. In the large open plan living dining room there is a dining table seating 6 comfortably. Outdoor 3 tables and chairs 2 on the terrance, and the 3rd is next to the BBQ area. There are numerous golf courses nearby. Mijas Golf is just 7 minute drive and La Cala is approx. 10 minute drive. Notes on accommodation: The air conditioning/heating is available and included in all bedrooms and lounge. There is also heating in the bathroom and an open fire in the lounge. As this villa is on one level and is enclosed and private it is very suitable for young children. Outside: The villa's south facing garden is laid to lawn with a terrace outside both bedrooms and another terrace outside lounge with BBQ area. The private pool is kidney shaped (8 x 4). The garden is also very private and secure. There are sun loungers and cushions and tables and chairs. There is also a pool table and table tennis table which are perfect for children as well as adults. The swimming pool has a shallow end which is suitable for children and non swimmers and is cleaned twice a week during the summer months. The BBQ area is shaded so that during the hot summer months it is perfect for a relaxing lunch or evening meal. This area is next to the outside door to the kitchen making it very easy for dining al fresco. Utility Room: The utility room leads directly off of the kitchen and has washing machine, iron and ironing board, hoover, additional storage shelves, washing line. It also has a door to the entrance porch. Towels and linen are included but beach/swim towels are not included. The property is cleaned prior to arrival and if occupied for two weeks the linen will be changed mid stay. If a clean is required mid stay there is an additional 100 euros. The nearest beaches are at Fuengirola and Torreblanca both being with easy reach of approx 7 minute by car. Fuengirola has approx 5 miles of beaches with many sunloungers provided. There are numerous restaurants on the seafront. The seafront is perfect for an evening stroll during the summer months as there are market stalls during the peak season and there is a vast choice of restaurants and bars. Malaga is the nearest airport and is 15 minute drive. Gibraltar airport is just over an hours drive. If you decide to take a ferry, both Santander and Bilbao are approx 10 hours drive. Mijas is a lovely Spanish village, it is approx 10 minute drive and definitely worth a visit. Puerto Banus which is a well know port is approx 30 minute drive. Gibraltar is approx 1 hours drive and is excellent for getting tax free products. Granada is a lovely place to visit. It takes between 1-2 hours to get there and you can visit the Alhambra Palace and also the ski resort of Sierra Nevada. Within 5 minutes drive there are various shops, supermarkets, bars, restaurants, pharmacy, banks etc. The Myramar shopping mall which has a huge variety of shops is just a 7 minute drive. There is also in this shopping mall several cinema screens which show English films. A recent addition to this shopping mall is Primark which has proved to be very popular.